Can the small screen take Elena from sometimes-heard to the Next Big Thing? Our Baby Name of the Day is inspired by Disney’s newest princess. 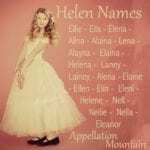 Helen became Helena in Latin, the name of an early saint. By the Middle Ages in England, Ellen was preferred. Arthurian myth preserves Elaine, which developed in medieval France. 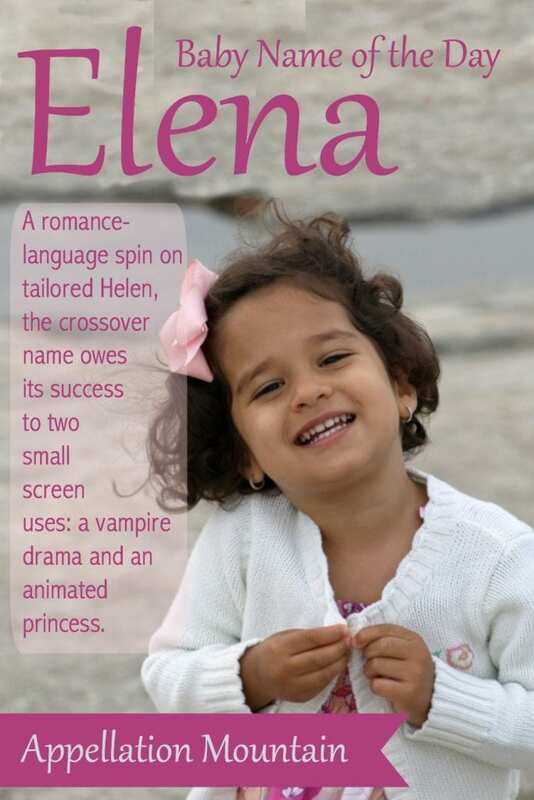 As for Elena, it evolved as a form of Helen in Spanish and Italian, as well as Russian and other Slavic tongues. Respellings of the name are also popular: #176 Alaina, #223 Alayna, and #291 Elaina. 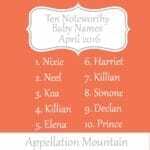 Factor in the alternate spellings, and this is a powerfully popular name. Nameberry’s Playground Analysis puts it at #39. The name has a long and consistent history of use. Elena has appeared in the US Top 1000 every year since 1885. It rose slowly, climbing from the 400s to the 200s, beginning in the 1970s. In fact, the name might have remained just outside the most popular names, if not for television. The Vampire Diaries debuted on The CW is September 2009. The story follows Elena Gilbert, who falls in with two vampire brothers over the course of the show’s first six seasons. Spoiler alert: it turns out that she isn’t just an ordinary girl. An eight season is currently filming, but Elena left the show after season six, courtesy of a Sleeping Beauty-esque coma. In 2009, the name ranked #195. By 2010, the name rose to #163, a new high. Elaina, Alaina, and Alayna all jumped around 2009/2010, too, suggesting that the show’s success influenced all spellings of the name. A second small screen boost is likely to take the name into the US Top 100. Elena of Avalor debuts July 22, 2016 on Disney Channel, a spin-off of mega-popular animated princess series Sofia the First. From the music to the look of the animated fairytale kingdom, the show is steeped in Latino culture. A big part of that is the new princess’ stylish English-Spanish crossover name. Names that work well in English and Spanish have dominated the US Top Ten in recent years. Sophia and Sofia, Isabella, Mia, and Emma all fit that description. Farther up the list, favorites like Victoria and Lucia serve as culture-spanning choices. Elena charts at #26 at Baby Center’s Spanish-language site. This makes the name a logical choice for parents after an appealing name that works beautifully in more than one language. And it isn’t just English and Spanish, either. The name appears in the Top 100 in Switzerland and Italy, Belgium and Croatia, Romania and Spain. For now, it’s still a name much less common than Isabella if you’re after a language-crossing choice. It’s also an appealing combination of tradition and pop culture, the classic and the current. Would you consider Elena for a daughter? Which spelling do you like best?